No matter the storm, God knows, God cares, and He is always there. The chaos of life can be overwhelming, and women get a heavier dose than most. Each day comes with its own pressures, heartaches, and disappointments that slowly erode the joy, peace, and closeness to God every woman needs. Chaos always feels like the enemy as it rages around us and inside us. But there is hope! In The Storm Inside, you will find strength in the most profound truths—that you are always a child of God no matter how you feel. In these pages, you will learn to see yourself as God sees you, not as someone forever tossed by the waves but as a woman fully known, fully loved, and growing ever deeper in faith, hope, and love. It is time as daughters of God to take the chaos of how we feel, lay it at the feet of God, and stand strong in who we are in Him. This simple teaching will be the difference between a life of joy and one of despair. Sheila powerfully reminds us that God offers no guarantee of a life without storms, but He does provide the strength and grace to make it through them. Throughout the last few years of my life, chaos has seemed to become a new member of this family. There were days where sun up to sun down felt drenched with chaos. And these last few months, ack, we won't even go there. To say I'm an emotional person is an understatement. 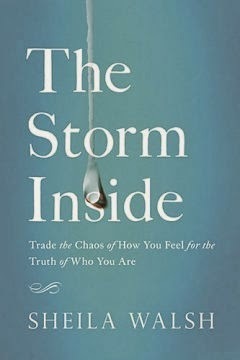 So a book that would help me deal with chaos and the emotions that go along with them? Yes, please! I thought this book was a great read! There were times I laughed with her and a few times some tears were shed. It's easy to get drawn into the conversation from the author. Each chapter addresses the storm topic and ends with a section on how to "stand through your storm" which included a few tips and a prayer. This is in no way a one-and-done book nor is our struggle. This is a book to read over and over, learning something new each time. This would be a great gift to someone you know is struggling.